Promo: Also try out our product Naview, which helps you to design and build navigation prototypes quickly and test the usability of your navigation with users. Naview is made specifically for people like yourself. It’s offered on a free plan, too! It is important that users can easily find the information they are looking for on your website – otherwise they will leave. To make sure they stay, it’s a good idea to test your new information architecture (website structure) with real users before building the site. Update 26 Sep 2009: I received an email from Steffen clarifying how to access detailed results for individual tasks, and I have amended this article accordingly. Thanks Steffen! I wrote about using Treejack from Optimal Workshop to test your website structure earlier this year. 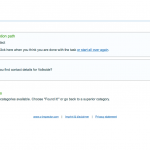 Treejack is a web-based tool that lets you upload your sitemap and define a number of tasks that you want your users to complete. 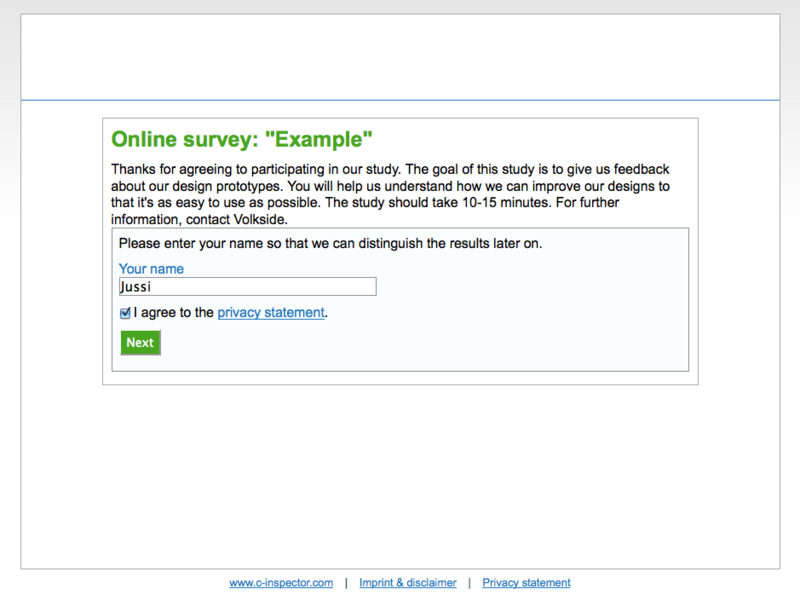 You can then invite people by email to take part in your survey, and review the results easily online. 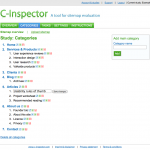 I recently heard about another new IA testing tool called C-Inspector (see above) from its creator Steffen Schilb, a freelance IA and user experience consultant based in Cologne, Germany. I took the trial version for a quick spin and summarise my experiences below. In fact, the process is pretty much the same even if you do it by hand, although in that case you’ll need run the testing in person. 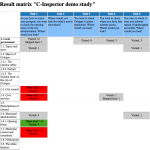 Read the previous article for more details on how to prepare IA testing. 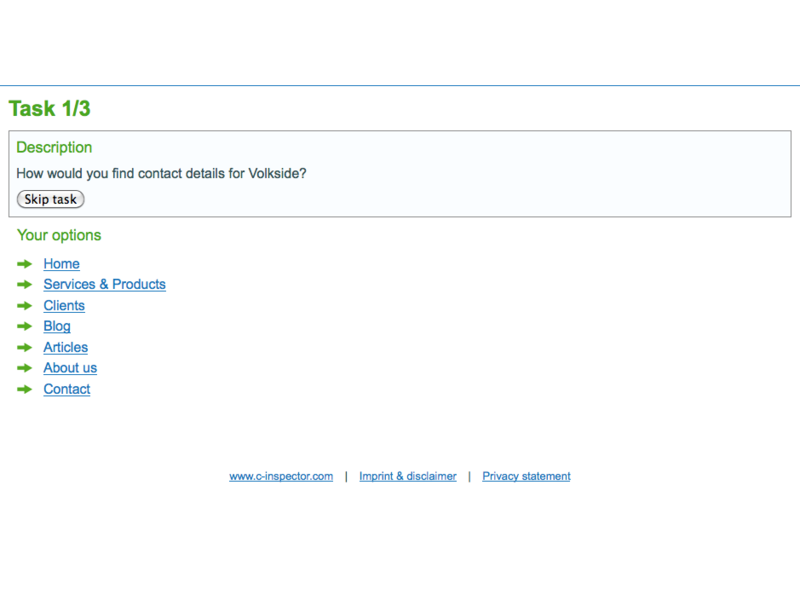 Write content for welcome page, instructions page and thank you page. You can set up the structure you want to test either using the built-in editor, or by uploading a CSV file (“comma-separated values”), typically exported from a spreadsheet document. 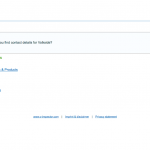 You set up user tasks on a dedicated tab (see above). The way you define the correct answers here will directly affect the results you get from your survey, so make sure you spend the time to think them through properly. 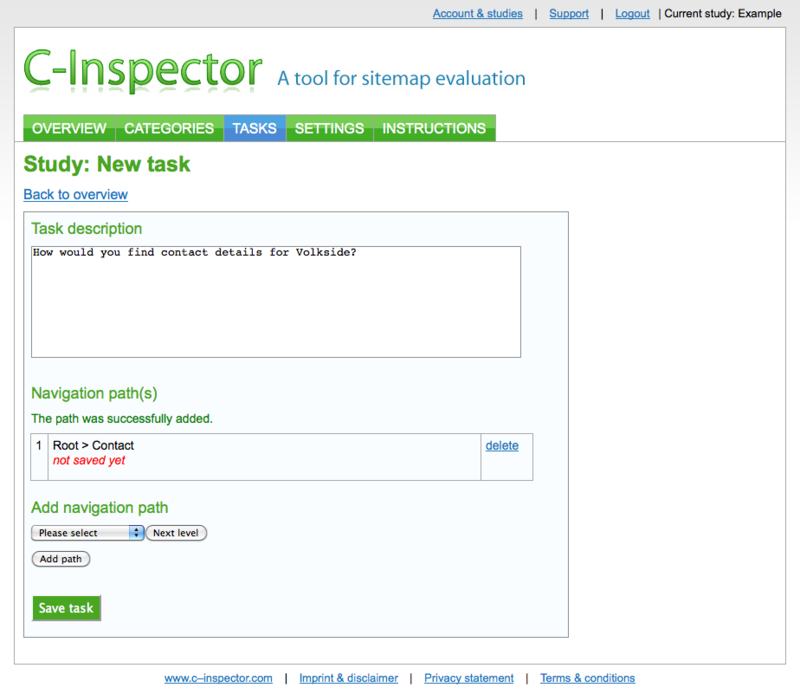 In C-Inspector selecting correct answers is done using the “add navigation path” interface at the bottom of the page. If your structure is deep you’ll be clicking the “Next level” button a lot – I feel Treejack’s interface is a lot quicker in this regard. 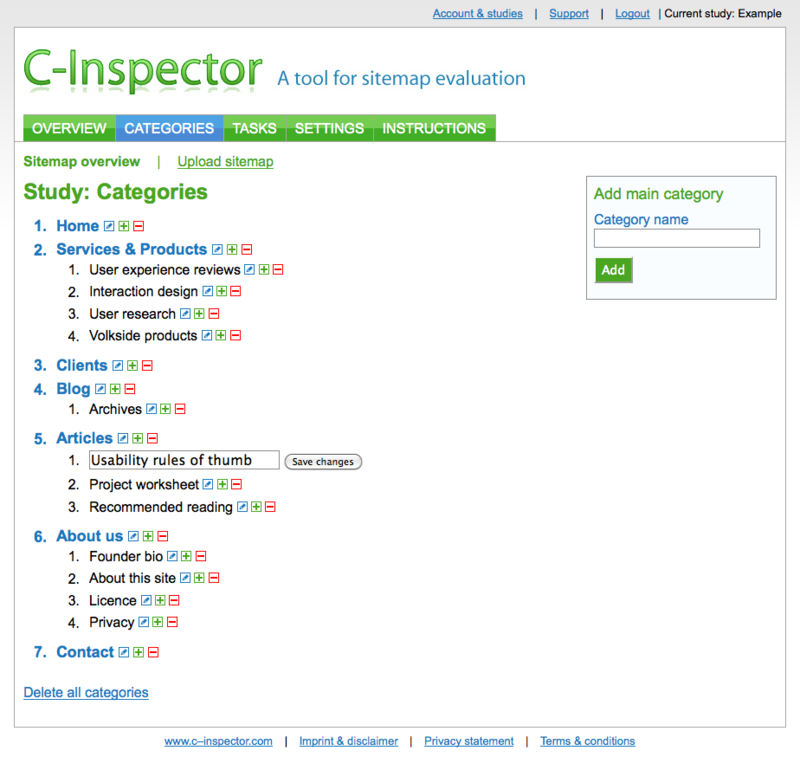 The study overview page (see above) gives a nice visual summary of the study and ensures that you have typed in the required details on each tab. 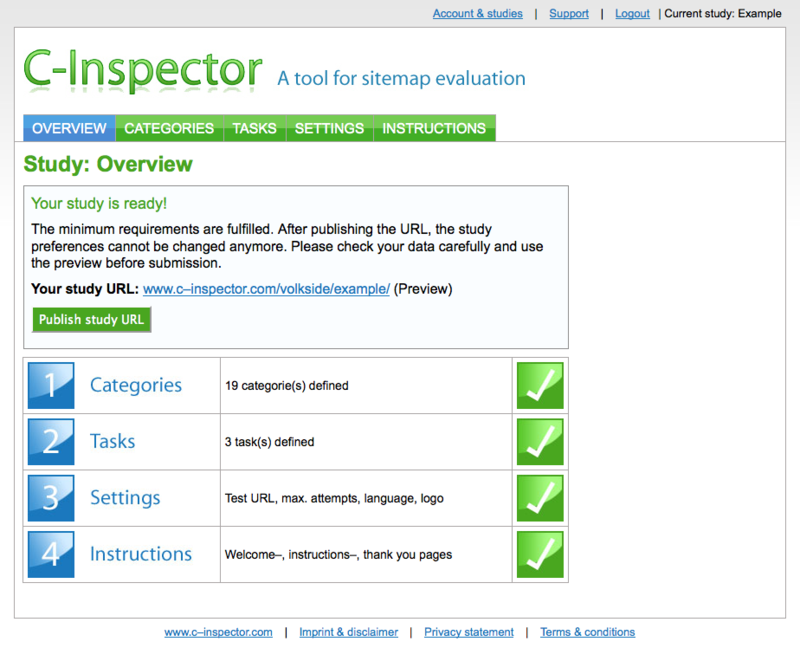 Before publishing your survey preview it several times and make sure all tasks can be completed using the proposed website structure. Completing the survey in preview mode will often reveal issues with the IA and help you improve the structure even before you test it with users. 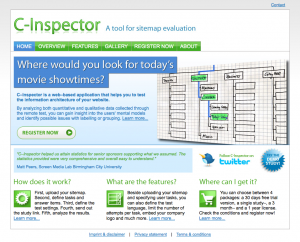 I found that the end user experience of C-Inspector is not quite as streamlined as that of Treejack. Navigating around in the structure is less intuitive, and some of the terminology is industry-specific (e.g. “subcategories” and “go back to a superior category”). 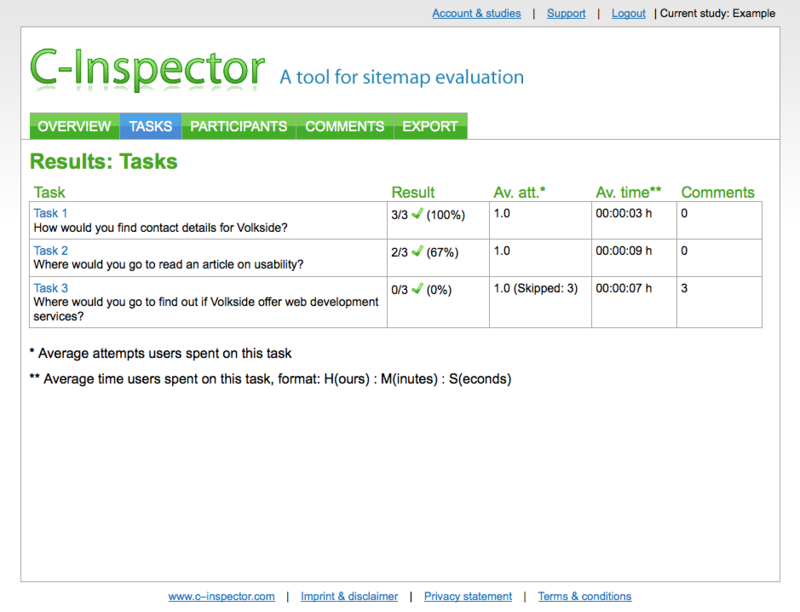 On the plus side, C-Inspector allows users to give feedback when they want to skip a task (to describe why they are skipping it) and at the end of the survey (for general remarks) – this is not possible using Treejack. 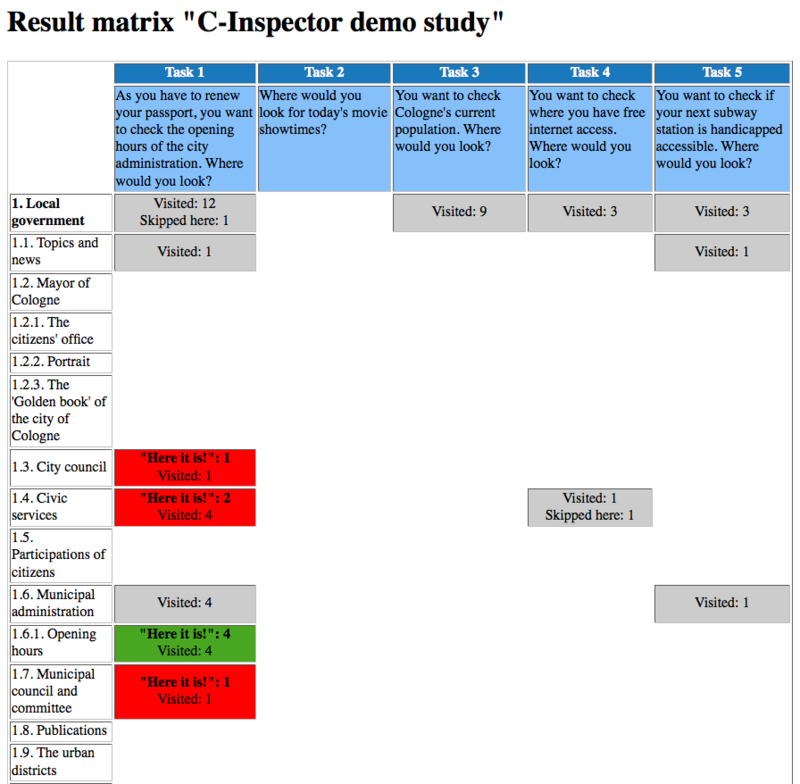 You can also drill deeper and have a look at the results for individual tasks (see above). 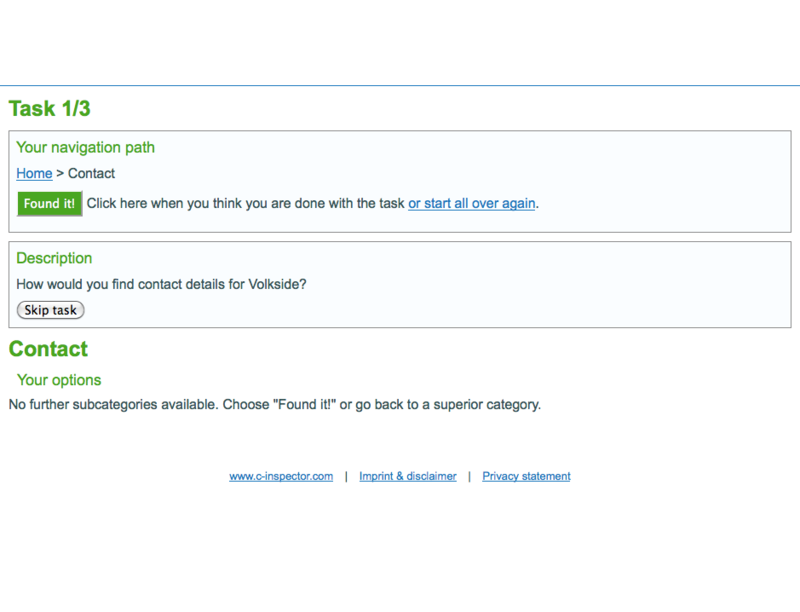 Update: You can access detailed results for each task by clicking the on it. These results include detailed click-through statistics that help you work out where users go off the intended path and where they end up in the structure. 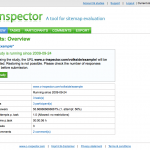 The reporting in C-Inspector is impressive and it includes details that are not available using Treejack. However the reporting ease of use doesn’t match Treejack’s. Treejack presents survey results visually and you can instantly tell which tasks tested well and which need further refinement. The three values Treejack produces – success, speed and directness – are extremely useful in determining where the issues lie. All prices are in US dollars. Both products offer a free trial plan so you can “try before you buy”. The CSV format for taxonomy upload is not ideal: Every time you want to change the structure you need to take the step of saving the file. 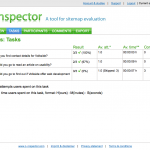 Compare this with the quick copy-and-paste experience of Treejack and tools like Naview. Taxonomy editing is difficult. The web-based interface allows for minor adjustments only, and any major changes need to be done outside the tool and the file re-uploaded. As above, I feel the text-based approach in Treejack is better. Selecting correct answers is slow. You need to click the “Next level” button a lot, whereas in Treejack the whole structure is displayed at once and you can select multiple correct answers in this single view. Once a study is closed it cannot be reopened or cloned and you need to recreate it from scratch. This means a lot of work if you want to re-run your study or use it as a basis for another one. C-Inspector doesn’t allow randomising tasks or siblings like Treejack. 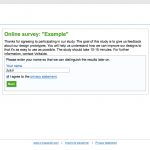 Randomising helps reduce learning bias when completing longer surveys. It also seems that there are some early version teething problems, for instance I lost instructions page text a couple of times even though I clicked the respective Save button. 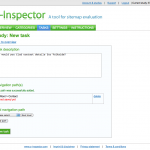 C-Inspector is a welcome addition to the expanding IA testing toolbox. 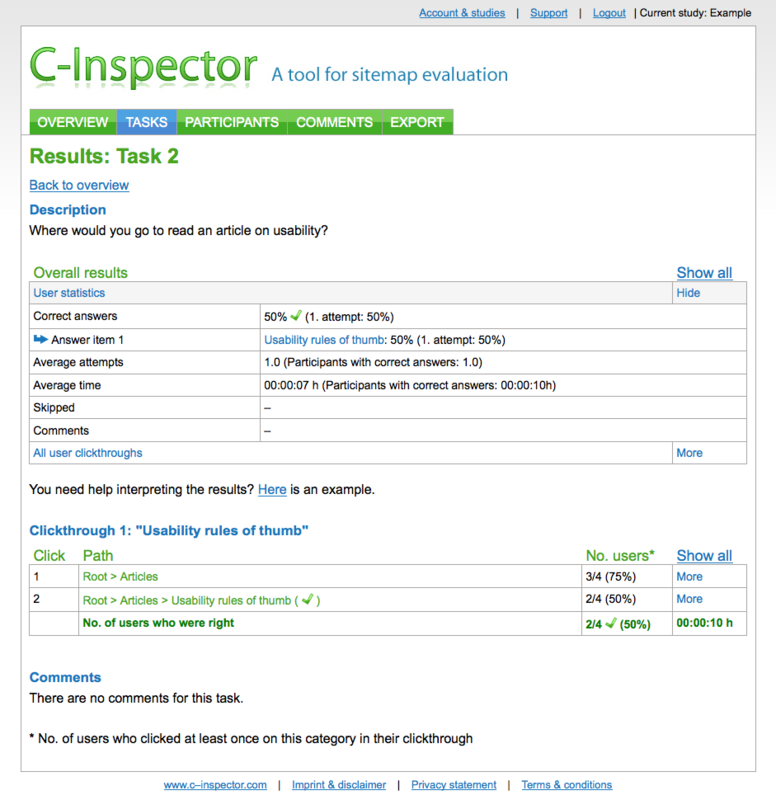 Like Treejack, C-Inspector helps you test your information architecture independent of the actual website interface and identify potential issues with the classification and labelling before designing a single wireframe. 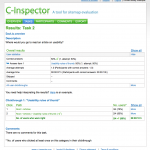 C-Inspector is a direct competitor to Treejack and from a functional and pricing point of view they are pretty much on par. However in practice Treejack feels more mature a product than C-Inspector. It’s all in the details: smoother interaction for survey setup and completion, sleeker visual design (subjective of course), better copywriting. Given the above, my current pick would be Treejack. 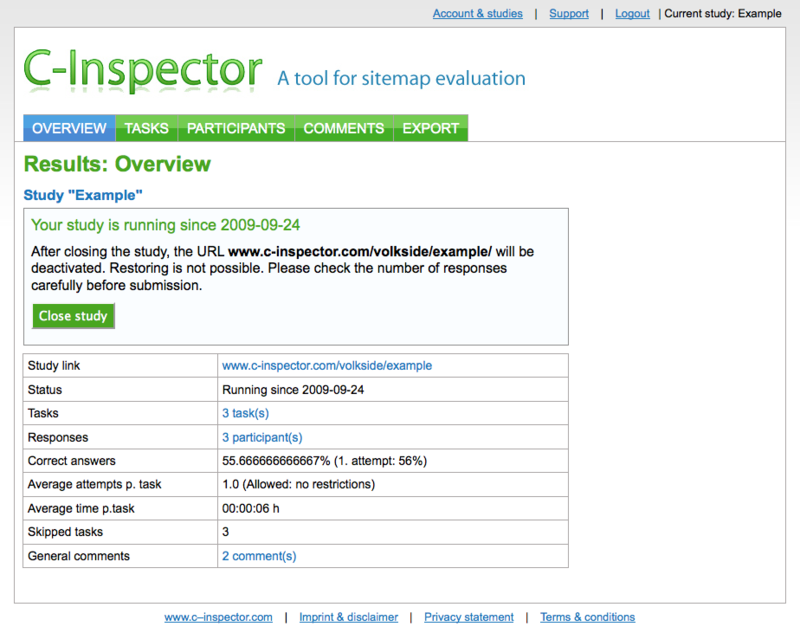 C-Inspector is a great start though, and I’m expecting future revisions to close the gap to Treejack fairly quickly. In fact, Steffen is already working on some of the improvements listed above. 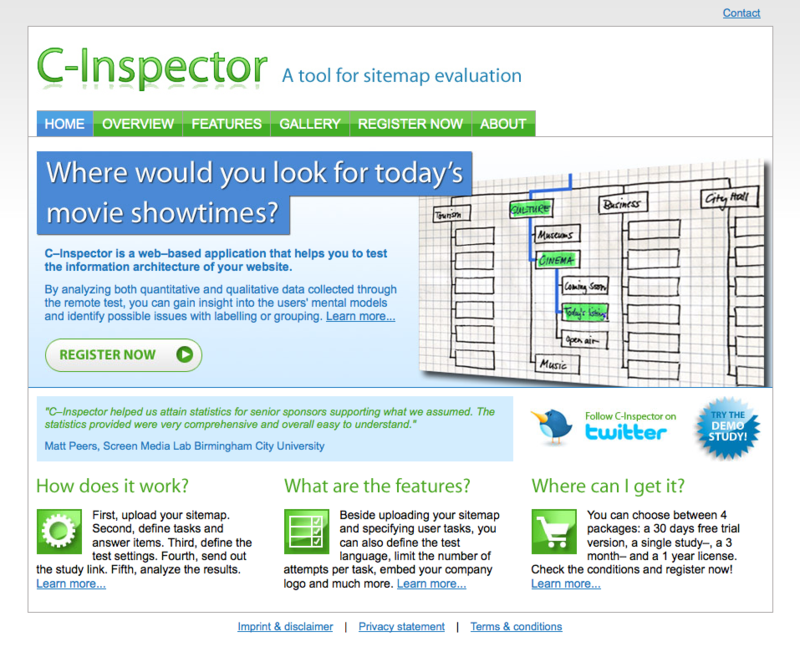 Don’t take my word for it – try out both C-Inspector and Treejack in your next project. Regardless of the tools, conducting even a little bit of IA testing is infinitely better than doing none! 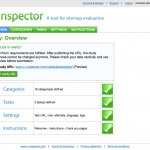 The author is not affiliated with C-Inspector or Optimal Workshop in any way.